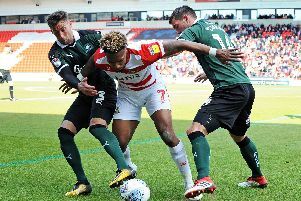 Doncaster Rovers fired a fourth straight blank in a dour stalemate with AFC Wimbledon - just to underline exactly where the work needs to be done this summer. Boss Darren Ferguson is in the midst of budget talks with the Rovers board and his immediate priority has to be more support for 15-goal John Marquis and a stand-in for skipper James Coppinger. Coppinger was rested for the second successive game and, in his absence, Ferguson tinkered with personnel and system in an attempt to jolt some attacking flair into his team. However, Doncaster flattered to deceive in an attacking sense. They have now failed to score for 385 minutes and counting. To describe a dire first period as ‘end of season fare’ was putting it politely as both teams mustered up one attempt on goal between them. Rovers improved after the break and at least got a few shots away but they lacked creativity and confidence in the final third. The draw means Doncaster can no longer finish in the top half of the table. For AFC Wimbledon it was enough to make sure they would be playing League One football again next season. Rovers will have to find a way of beating promoted Wigan Athletic on Saturday to avoid ending the season without a victory from their final six games. Ferguson continued his late season policy of freshening things up by making four changes from the team that drew 0-0 at Oldham Athletic on Saturday, recalling Tom Anderson, Alfie Beestin, Alfie May and handing Issam Ben Khemis his first appearance since January. Beestin, operating at left wing back, saw a fair bit of the ball early on but there was precious little for the home fans to get excited about. Indeed it took 26 minutes for the hosts to register their first attempt on goal but Ben Khemis lashed his shot from distance high and wide. Wimbledon started with more intent but their direct approach struggled to really trouble Rovers and their no-nonsense centre back pairing of Andy Butler and Anderson. Dean Parrett volleyed over after Callum Kennedy’s free-kick struck the wall, while Joe Pigott headed a decent chance straight at Ian Lawlor. There was a distinct end of season feel to proceedings, with neither side showing much fluency or urgency. Possession was all too easily given up by both teams. Rovers, who had switched from a 3-5-2 to 4-4-2, improved slightly during the later stages of the first half but it was Wimbledon’s Jon Meades who went closest to breaking the deadlock with a shot on the angle of the box that flashed narrowly wide. Beestin’s third positional change saw him start the second half up front with Rodney Kongolo replacing Alfie May. The game showed signs of improving following the re-start as both sides went close. Lyle Taylor latched onto a route one clearance by goalkeeper George Long but his goal-bound effort was deflected wide, before John Marquis headed straight at Long after Anderson headed a free-kick delivery back across the face of goal. Rovers had upped the ante and, after barely getting a sight of goal before the break, Kongolo and Matty Blair both sent decent efforts wide. Ben Whiteman also forced Long to palm away a well struck effort from outside the box. But they continued to lack a genuine creative spark and killer final ball in the final third. Much to the frustration of the home crowd, it was Wimbledon who might have nicked all three points when substitute Kwesi Appiah hooked a clever effort just over the bar and then saw a goal-bound close range shot blocked by Niall Mason.